How to Kayak in the Winter Without Frostbite…or Anything Else Unpleasant. Think about pure winter bliss. The snow-capped mountains, the frost-bitten trees, and the stillness and peace the crisp air offers. Of course it’s tempting to pack up your inflatable kayak and hit one of the lakes that aren’t completely frozen solid yet. But can you kayak in the winter without coming down with sickness or getting frostbitten? Yes. Now, we’re lucky to be here in Arizona. The lakes that truly freeze solid are far up north, so though it might get cold, the waters are usually still ready for us to paddle. However, it’s important to do plenty of research before you grab your kayak and hit the road. Check the weather conditions to stay apprised of temperatures, wind speeds, direction, and ice coverage. Check the National Parks updates to see about the park conditions. If visibility will be low, or if landing spots look a little icy or sketchy – don’t even risk it. Save your kayak for a clearer, calmer day. Wetsuits are a great way to keep warm, while maintaining your paddling mobility. These snug neoprene garments don’t keep water out, but rather trap a thin layer of water next to your skin where it’s warmed by your body. Neoprene minimizes evaporative cooling, so once you are out of the water, you remain comfortable. Keep in mind: most paddlers opt for 2mm or 3mm neoprene. Polyurethane-coated fleece is another available fabric, best worn when immersion in cold water is less likely. Warm, stretchy and windproof, it resembles neoprene, only fuzzy. Bib & Dry Tops are a good compromise if you don’t want to go ‘onesie’ style on the water. These two-piece style dry suits are lightweight, are an inexpensive solution for boaters who wear a dry top the majority of the time, but need the added protection for bigger and colder water in case of an unexpected swim. Kokatat’s Whirlpool Bib with a Rogue Drytop are a good pairing to keep you dry, and keep your core cozy and warm. Paddling Shoes or Neoprene Socks are a must to keep your feet dry and warm. The NRS Hydroskin Wet Socks would work great under boots, or the NRS Paddle Wetshoes are a neoprene lined bootie designed to keep your feet toasty. Either option works great and will keep you nice and warm. Double Up on Your Accessories like hats, paddling gloves, and mitts to make sure you always have something dry to change into. #3. Prepare to Build a Fire! Is there anything more wintry than a fire? Know how to collect dry wood, and bring a foldable saw that allows you to cut it into logs. Remember: Trying to burn anything larger six inches in diameter creates a sputtering fire and leaves a mess – so make sure to cut your wood pieces smaller. A tent with an inner canopy made of more fabric and less mesh is the ideal tent for your overnight winter stay. However, setting up on snow creates an almost freezer-like effect inside. If it’s possible, find dry ground. If you must set up on snow, pack it down and allow it to set for at least 30 minutes before putting up your tent. Add a candle lantern inside your tent, and you’ll be surprised at the amount of warmth that generates inside. 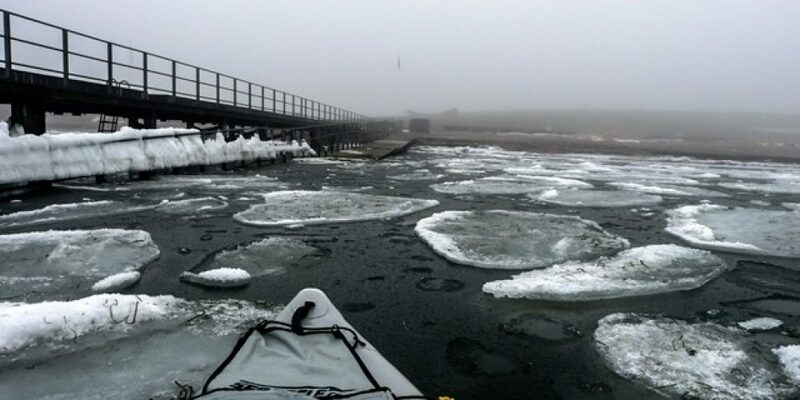 Winter kayaking can be challenging, but it’s rewarding. Take your time, be prepared and enjoy the beautiful sights of your winter wonderland. There’s nothing quite like being in nature during this time of year – take it all in.